It's a common question: your child seems so smart, but still isn't doing well in school. Do they have a learning disability? Many kids are verbal, bright, and even seem "gifted." Yet, when they go to school and have to start studying, writing, and taking tests, they find themselves struggling. Sometimes, children who show advanced skills before school still don't make satisfactory grades once they begin, and may even get judged to be below grade level.This understandably prompts frustrated parents to urge their children to try harder -- after all, when children seem smart, we expect them to do well in school. But they may already be doing their best. In fact, they may be held back through no fault of their own -- it could be because of a learning disability. If you don't know why your smart child is struggling, they may have a learning disability. Without proper testing from a licensed physician, it's hard to be sure if a child truly has a learning disability. But as a parent, it's still important to be aware of the symptoms that show a visual processing system in distress. Assessing a child's written work is the key -- most of the school day is spent writing and copying, so if the child is having issues processing visual stimuli, then it may be time for intervention. They may be held back through no fault of their own -- it could be because of a learning disability. Certain exercises can strengthen the visual system without needing medical or pharmaceutical treatment. For example, eye muscles can be strengthened by patching one eye and and having the child track an object from left to right, and then in different patterns. When your child potentially has a learning disability, simply buying another workbook aimed at the same academic skill sets isn't going to help. To correct any learning problem, it's vital to go straight to the source, find out what's going wrong in your child's learning methods, and then correct it. In fact, there are specific brain exercises and games you can do with your child to begin to improve their learning ability, and we'd at the Learning Success System would love to help you discover them. Our simple online analysis tool can help you find what areas need strengthened. If children who seem intelligent inexplicably struggle in school, it may be a learning disability. 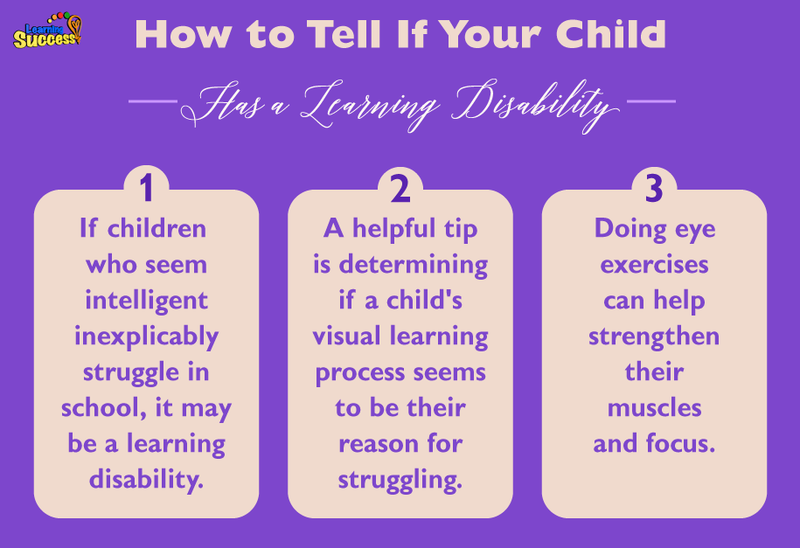 A helpful tip is determining if a child's visual learning process seems to be their reason for struggling. Doing eye exercises can help strengthen their muscles and focus. Never be ashamed and try not to worry -- even though it may at first seem daunting that your smart child has a problem, identifying that there is a problem is a huge step to getting through this. The earlier you get your child started on an educational therapy program the faster you can remediate the problem and get back on track to a successful future for your child.